We have been privileged to support the Happy Canyon & Pendleton Round-Up Court members through scholarships for the last 20 years. During this time over 150 young women have received scholarships and opportunities to pursue high education. To celebrate the 20th year of the Jordan Schnitzer Family Foundation providing tuition assistance for higher learning to the Pendleton Round-Up and Happy Canyon Court members we spoke with multiple past queens and princesses who shared their experiences, lessons learned, and where they are today. Cydney Corey Curtis was queen in 2004 and a princess in 2003. She currently lives in Pendleton, Oregon, and is a fifth grade teacher at Sherwood Elementary. 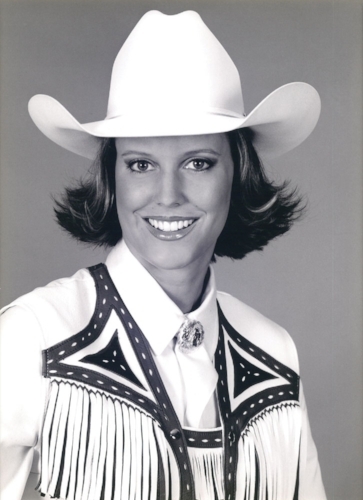 Jennifer Levy Currin was a part of the Pendleton Round-Up Court in 2003 and 2005, and served as queen. She currently is an attorney living in Pendleton, Oregon, with her family. Last year she was the President of the Oregon State Bar Family Law Executive Committee (FLEC) and this year was selected to the 2018 Oregon Rising Stars list by Super Lawyers publication. When discussing the benefits of education, Jennifer said, “my education improved my discipline, focus, writing skills, and confidence to tackle life problems. My education prepared me for the future. Last year, I was appointed by Governor Brown to represent Oregon’s 2nd Congressional District as a commissioner on the Oregon Liquor Control Commission (OLCC). I know my legal education and background are what led to my appointment. I am honored to serve our state. My legal education has opened doors and allowed me the opportunity to serve others. Without a doubt, the scholarship helped me obtain my goals. I was responsible for funding my law school education and the scholarship that I received from my queen year helped reduce the size of my law school loans. The scholarship helped me come out of law school with more freedom to choose a career I was passionate about instead of worrying about paying back my student loans. I remember the stress of signing my name on the dotted line to take out student loans and I am thankful the scholarship could relieve some of the stress. In my opinion, at that time in my life, there was no greater gift than a scholarship to help fund my education. The scholarship recognized that I (and all of our court members) had educational and career goals for the future. The scholarship allowed us the opportunity to serve our community on the court and achieve our educational goals at the same time. Marissa Baumgartner was a Happy Canyon Princess in 2015. She went to OSU, studied in the college of Public Health, and graduated with a degree in human development and family science, with a focus in child development. Marissa currently lives on the Umatilla Indian Reservation and works at Yellowhawk Tribal Health Center as the Alcohol and Drug Prevention Education Program Coordinator. Marisa shared, “my education is something that is a privilege not all in my community have had the opportunity to access. I am a first generation college graduate, so that alone is a gift. Education has always been my foundation, and my parents always pushed me to do my best so that I didn’t have to struggle in the same ways that they once did. Without my education I would not have the knowledge about children, people, and life in general. Studying human development has not only been key in my field, but has also created an opportunity for me to learn about the brain and why us humans are the way we are. Through this learning I have been able to find so much healing and solace in my own life, as well as the lives of my ancestors. Through learning this knowledge I have the opportunity to share and teach others about the developmental stages from birth through the end of life. This knowledge allows people to start to understand their own lives and truly begin to create a life they want to live. Human Development is especially important in my work in Prevention. Teaching students about the development of their brain throughout childhood is the best way to teach kids to protect their brains, and why staying drug and alcohol free is important during these crucial periods of development. Before having the opportunity to attend college, this information was foreign to me. Without my education, I would not be able to help or impact people in the way that I do today. All in all, my education has given me the eyes to see that all people go through hard times, and allows me to look at someone, breathe with them, and let them know that I hear them and they are seen. We never know what each person faces throughout life. By remembering this, we are able to see each other through compassionate eyes and remind ourselves that we, too, have had hard times. I paid for the first two years of community college myself, and these scholarships truly made school more realistic and possible for me. Most of my life I stressed about money, and to know I was going to have at least a portion of my expenses paid for, took a lot of that stress off of my back while I was attending college. Tiah DeGrofft was the Pendleton Round-Up Queen in 2015. After graduating from OSU in 2002 Tiah I went to work for Peter Jacobsen Productions producing PGA Tour Events. She was relocated to New England and while there started a sports marketing company with 4 of her colleagues. After 5 years, she wanted to be closer to family, and decided to move back to Pendleton. She worked for Wildhorse Resort and Casino handling their community relations and in January accepted her current position at Graybeal Distributing and is loving the new challenge. Discussing what she learned being part of the Pendleton Roundup Court, Tiah said, “I am not sure I can even put it into words, which is really something for me! Being a communication major, the Court really helped with my public speaking and confidence. I have worked in male dominated industries, where often times, they are many years my senor. Being on the court helped me become comfortable with walking into a room and standing toe to toe with anyone, whether it be to have a conversation or negotiate a deal. It was also extremely eye opening for me to see how special of a place Pendleton is. Out of every community we visited, none of them could compare to Pendleton's support of their community and the pride they have for our event. It is truly incredible. Katie Marie Harris (Khapkhaptsonmi) was part of the 2010 Happy Canyon court, the 2012 Pendleton Round-Up Court, and was the Pendleton Woolen Mills 2013 American Indian Beauty Contest Winner. When reflecting on what she was able to accomplish with the scholarship, Katie said, “My education got me many great volunteer opportunities, workshop experiences, collaborations, & the stepping stone to my next destination (MPH). Finishing my undergrad is the first step & foundation to new experiences and goals.